Xiaomi Mi Mix 4 is rumoured to sport a triple camera setup and it could be powered by Qualcomm's latest Snapdragon 855 processor paired with an Adreno 640 GPU. Xiaomi has put out a teaser of its next-generation bezel-less smartphone, dubbed as Mi Mix 4. 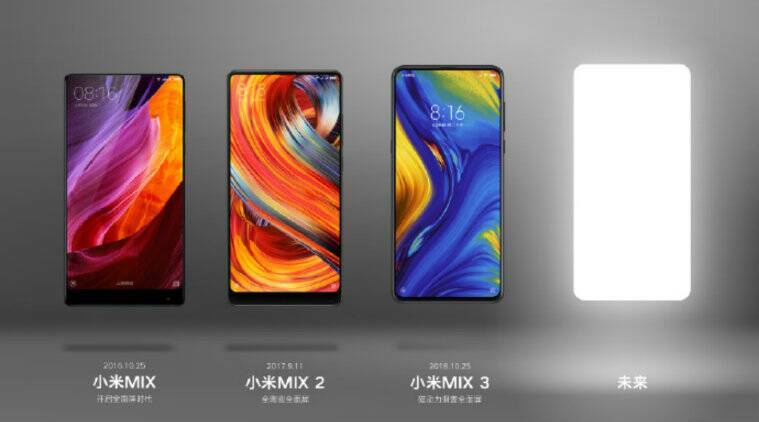 The teaser on Xiaomi’s official Weibo account, shows off the Mi Mix family of smartphones, including Mi Mix, Mi Mix 2 and Mi Mix 3 along with a blank space, hinting at the next generation Mi 4. According to recent reports, the device might sport a triple camera setup and will be powered by Qualcomm’s latest Snapdragon 855 processor paired with an Adreno 640 GPU. To recall, the company originally launched the Mi Mix as a concept smartphone back in 2016, which was brought to select markets only. It was then followed by the Mi Mix 2 in 2017, which also made its way to the Indian market. The company then launched a mid-cycle update to the device, dubbed Mi Mix 2S in 2018, which was again launched in select markets. Xiaomi also launched the Mi Mix 3 last year, which is yet to make its way to the Indian market. A 5G variant of Mi Mix 3 was also announced at the Mobile World Congress this year. The 5G variant is powered by the Qualcomm’s Snapdragon 855 processor paired with an X50 5G modem. Detailed specifications of Mi Mix 4 are unclear at this point, though we could see more leaks around the device as launch nears. A official launch date from Xiaomi is also awaited. The teaser on Weibo is among the first of its next Mi Mix smartphone and it remains to be seen if it will be called Mi Mix 4. Meanwhile, to recap specifications of Mi Mix 3, it comes with a 6.4-inch full HD+ OLED slider display, Snapdragon 845 processor, up to 10GB RAM, up to 256GB internal storage, and 3,850mAh non-removable battery. The phone has 12MP dual camera setup on the back.